The building connects a series of previously unsuccessful public open spaces and disparate buildings by incorporating layers of Building, Landscape and Events Spaces to respectfully integrate the new building into the existing precinct, creating a new identity and strengthening civic conditions within the site. The design can be understood and experienced in different ways at the human scale as visitors move around, up or through the building, blurring the distinction between architecture and landscape with each interface responding uniquely to its immediate context. The design can be understood and experienced in different ways as the user walks around, up, or through the building. It blurs the distinction between architecture and landscape with each interface responding to its context. 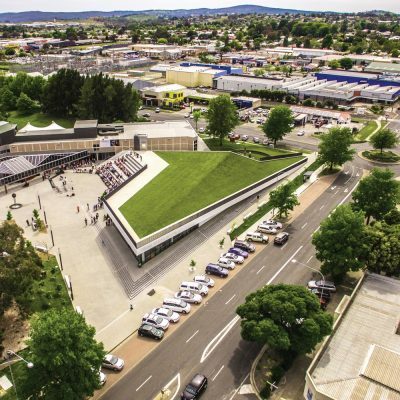 The grassed roof is a defining feature of the design, rising from the existing lawn, providing a public green space and new vantage point to the adjacent park and across Orange City. 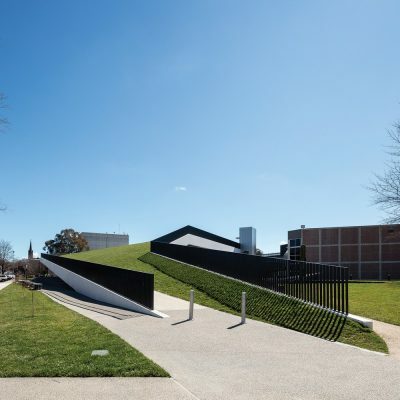 Intended as a flexible space, the lawn can be used for a variety of functions including outdoor exhibitions or simply an area for locals and visitors to relax or play. 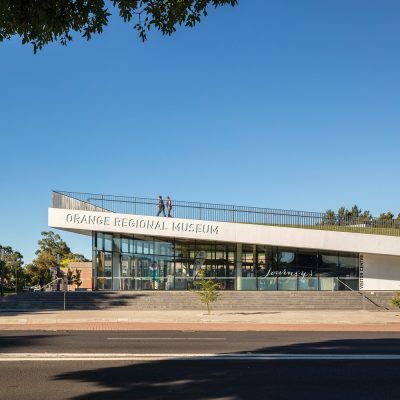 Located in the City of Orange, a regional town 260km (162 miles) northwest of Sydney, Australia and with a population of approximately 42,000 people, the Orange Regional Museum development was designed to form an integral part of a community and cultural precinct for the town and surrounding area. Crone was awarded the project via a competitive tender process in early-2013 with the project completion and launch date in November 2016. The building envelope is shaped to accentuate a line-of-sight to the existing library and gallery, giving prominence to a significant public building. The public domain strategy incorporates a new civic square to accommodate events while large seating steps create a public amphitheatre and a ramp loops the building, providing access to the lawn. 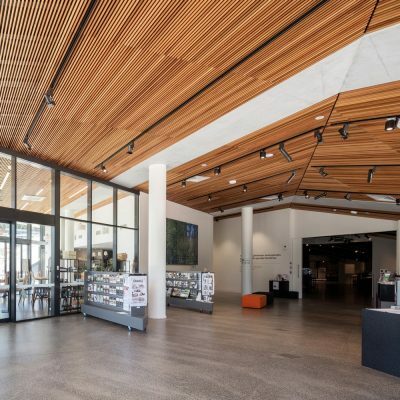 The resolution of the complex, angular geometry and attention to detail were critical for a building that uses a minimal material palette of concrete, glazing, metal panel and grass. 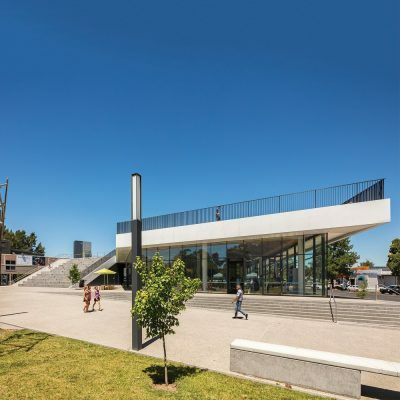 The Orange Civic precinct site encompasses a suite of existing buildings including art gallery, library and theatre as well as a series of vacant lots within a large block of council owned land. 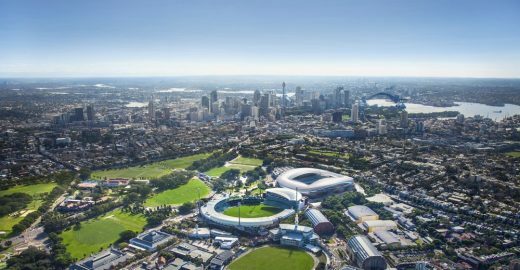 The chosen museum site was in some ways the most challenging and constrained portion of the precinct but also presented the greatest potential to connect a variety of programs, pedestrian routes and desire lines with a strong presence to the city centre and adjacent park. 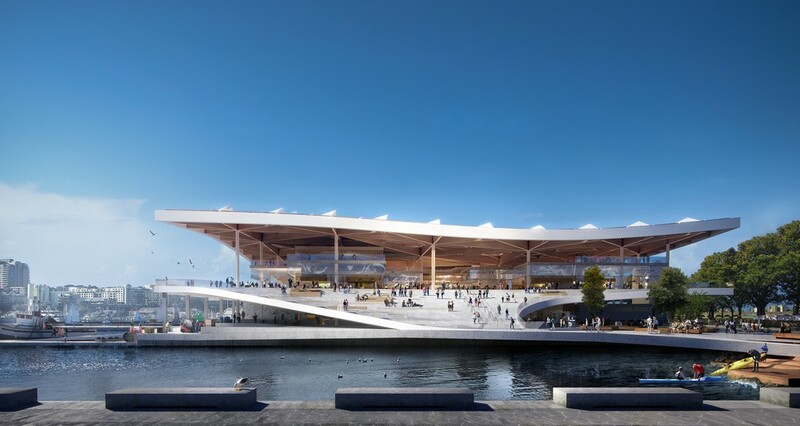 Crone is an award-winning architectural and consulting firm with offices in Sydney and Melbourne, working in markets across Australia and Asia. 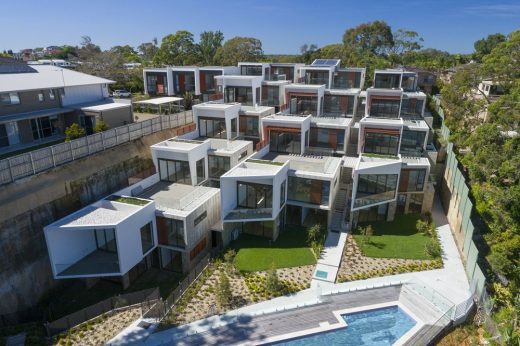 From inception almost 50 years ago, Crone has built an impressive reputation for designing and delivering large-scale commercial projects and has evolved into a distinctly design-driven, multidisciplinary practice. Crone recognises that intelligent, creative architecture unites technology, sustainability and human emotion and this, coupled with a decades-strong network within the design and construction industries, allows the team to formulate thorough design solutions across all scales and sectors. Realising that with every project there is an opportunity to explore beyond the traditional bounds of architecture, Crone tackles problems from unpredictable angles and finds thoughtful, innovative solutions. The practice embraces a collaborative approach, committing a highly experienced and well recognised team to work closely with clients, using innovative strategic thinking that allows the firm to balance sustainability, market awareness and design excellence. Crone’s methodology separates the us from our peers. Regardless of scale, we treat every project with the respect it deserves, carefully considering issues of commerce, functionality and brand identity. Winner – Orange Regional Museum and Community Centre by Niall Durney & Ashley Dennis is Winner in Architecture, Building and Structure Design Category, 2017 – 2018.